I know a lot of my family see these posts and I have a photograph of a wedding that is a mystery! Can anyone help? 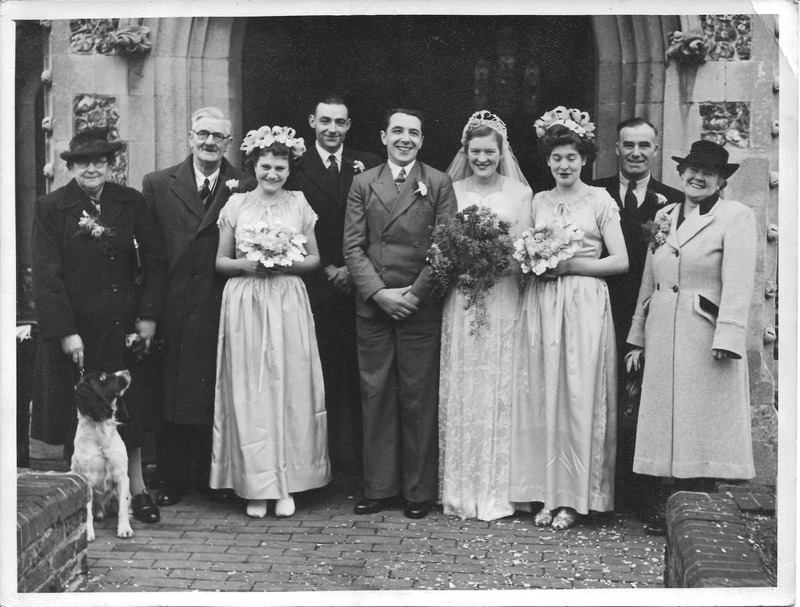 The couple of the left, with the dog are my mother’s adopted parents Mr & Mrs Howells (not sure of their first names yet). As they’re standing on the bridegrooms side, it leads me to believe the groom is probably the family member they’re connected to. From comparing the background it doesn’t look like St Mary’s in Shoreham, where my parents got married. Any help gratefully received! This entry was posted in Jack Howells, Winifred Howells. Bookmark the permalink. I guess that’s how it was done then, and not too differently now, as my daughter’s wedding photos will testify – there we are all lined up in our hats and finery! No dog, though!